LG may not be doing as well as its Korean compatriot Samsung, but that doesn't stop it from playing in every mobile category. 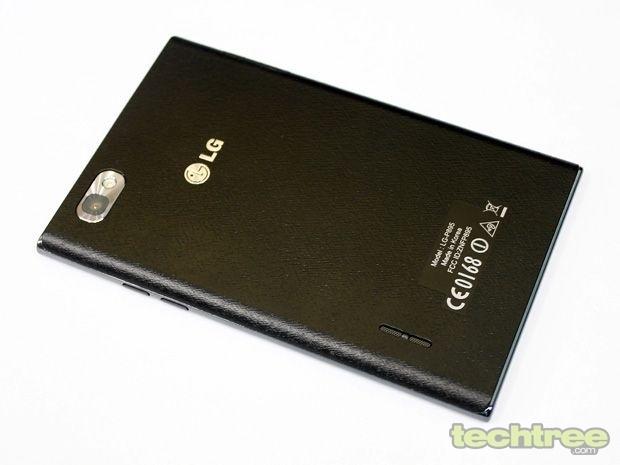 In what seems to be a response to the GALAXY Note 2, LG has introduced a phablet, the Optimus Vu in the Indian market. 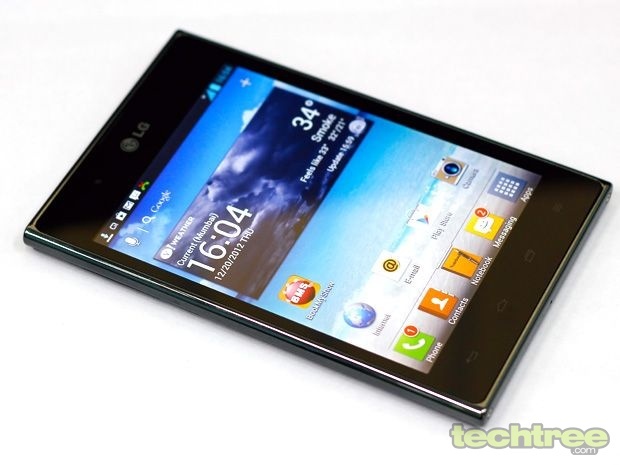 On paper, the specs look impressive: a quad-core NVIDIA Tegra 3 chipset, a 5" IPS screen, and an 8 MP camera stand out. When we got our hands on the Optimus Vu, the question in our minds was, will it (or can it) pose a serious threat to Samsung's popular phablets, or will it go unnoticed like the company's Optimus Pad tablet? The Optimus Vu has a design language similar to that of LG's L-series smartphones. It's impressively slim and has a nice textured back panel. There's actually not much to complain about as far as the device's build quality in concerned. In terms of size though, I think LG has got its basics wrong. The company's decision to go with an odd 4:3 aspect ratio (1024x768 pixel display) gives it a wide form factor, making the phone so uncomfortable to hold that the Note II feels normal! (if you have used the Note II, you'll understand it is anything but normal, at least as far as first impressions go). Using the handset with a single hand is beyond the bounds of possibility. If you don't use a handsfree during calls, the phablet makes it look like you're holding a brick to your ear. Below the screen are four capacitive Android buttons. The phone does not come with a removable back panel, which means that the battery is not user replaceable. Apart from the standard controls, there's a dedicated QuickMemo key next to the 3.5 mm jack. The Vu's 5" IPS screen has pixel dimensions of 1024x768 (it's been a while since we saw this resolution - reminds me of old CRT monitors). The display is bright, and its colour reproduction is good too. With its pixel density of 256 ppi, the screen looks impressively sharp. However, the panel's sunlight legibility and black levels are disappointing. Viewing angles are narrow, and there's a slight yellowish tint to the display. Another gripe I have here is that the display isn't protected by the Gorilla Glass or anything similar, which means it is prone to scratches. The package contains a charger, USB cable, earphones, stylus, and paperclip (for opening SIM slot). At the heart of the device lies a quad-core NVIDIA Tegra 3 chipset clocked at 1.5 GHz. For photography, there's an 8 MP autofocus camera with an LED flash to keep it company. Other features include Wi-Fi, Bluetooth, A-GPS, NFC, 1 GB of RAM, 32 GB internal storage, Micro-USB port with support for MHL (but no MHL-to-HDMI adapter is included). The complete spec list is at the end of the review. The Vu runs Android 4.0 with LG's customisation on top of it. Thanks to a powerful CPU, the transition effects are virtually lag free. Although the UI is not exactly tacky, LG could have done with fewer colours (but then, color schemes are subjective). Taking advantage of the screen area, LG has provided an option to add large toggle buttons for Wi-Fi, NFC, and Bluetooth to the notification bar. The company has modified all the pre-installed Google apps to match the phone's screen size. Particularly, the Notebook app makes best use of the available space. Taking notes and doodling is simple as it should be. However, unlike the Samsung's S-Pen, LG's stylus is basically just a stick. So basically, it's good for drawing, but don't expect anything fancy like Quick Commands and Air View. I tried drawing with my finger and that worked perfectly, too. Considering that there's no provision to tuck the stylus inside the phone, many people would actually prefer using their fingers instead. The browser is one of the areas where this phone shines. It's quick to render pages, and supports web videos as well. A nice touch here is the 3D card interface used for switching between tabs. The processor is capable of handling every game in Google's Play Store - unfortunately, most games are optimized for screens with 16:9 aspect ratio, and therefore look stretched on this phablet. Check out the screenshot below to get a better idea. On the other hand, non-multimedia apps such as Skype, WhatsApp, and various browsers work fine. For those interested in benchmarks, the Optimus Vu scores 6588 in AnTuTu. 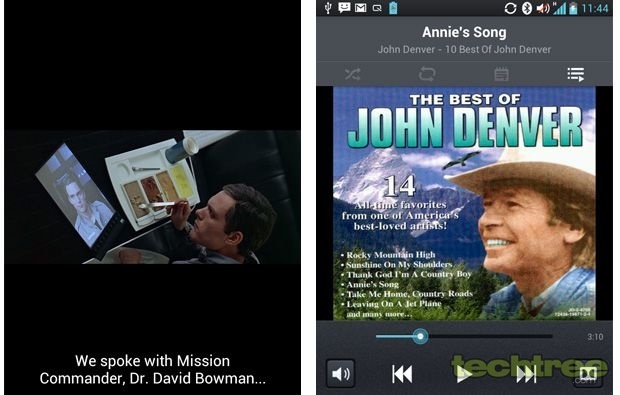 The music player's interface is simple and easy to use. It offers a Dolby Mobile enhancement mode, as well as a plethora of equaliser settings. More importantly, the sound quality is quite good. The phone supports most video formats including MP4, DivX, XviD, and MKV out of the box. It also offers a few interesting features, including the ability to control the playback speed from 0.5x to 2x, zooming in and out of a video, and an enhanced seek bar that displays a thumbnail of the frame at the target location. There's support for subtitles as well. However, due to the odd aspect ratio, a large part of the screen gets wasted. Here's a screenshot to help you understand better. The 8 MP camera is accompanied by a single LED flash. It allows you to adjust ISO, white balance, and colour effects. Although there's no dedicated capture button, the [volume -] key works as a shutter release button, much like on the Optimus 4X HD. The resulting images produce accurate colours. However, that's the only positive thing about it. Even in well-lit environments, the photos are marred by excessive noise. The image quality simply can't justify the device's price tag. The Optimus is capable of recording 1080p videos at 30 fps. The clips are saved in the MP4 format and offer smooth playback. The phone's network reception is strong, as expected at this price point. Additionally, the signal strength of the Wi-Fi and Bluetooth connections seemed quite good during testing, but take this with a pinch of salt, since brief signal strenght test are not conclusive. Coming to the subject of messaging, the big onscreen keyboard is a godsend for messaging junkies. The Optimus Vu packs in a 2080 Li-Ion battery. In our 720p video loop test, it lasted around 6 hours and 30 minutes. Considering the size of the device (and hence the ability to use larger batteries), it should have been better. To put things in perspective, the GALAXY Note II lasted for 11 hours. All the positives mentioned so far in the review do not add up to offer a compelling enough package for me to recommend buying this device. Let's not forget, it's very uncomfortable to use as a mobile phone. Even with a large screen, the Vu is not fit for watching movies (movies today at 16:9 aspect ratio would become letter-boxed). Moreover, its stylus integration is nowhere close to what Samsung has done with its S-Pen. So if you're looking for a high-end phablet, the Samsung GALAXY Note II seems to be a better bet. 1.5 GHz Quad-core NVIDIA Tegra 3 chipset, 1 GB of RAM. 5" IPS screen with 1024x768 pixels, 4:3 aspect ratio, 16 million colours. 8 MP auto-focus rear camera, 1.3 MP front camera. Camera features: 8x zoom, Time machine shot, HDR, Panorama, Continuous shot, Beauty Shot, 1080p video recording at 30 fps. Wi-Fi, 3.5 mm Jack, Bluetooth, A-GPS, NFC. 32 GB internal storage, Micro-USB port with support for MHL. Quad-band GSM (850, 900, 1800, 1900 GHz), Tri-band 3G (W900, W1900, W2100 MHz), Micro-SIM slot. 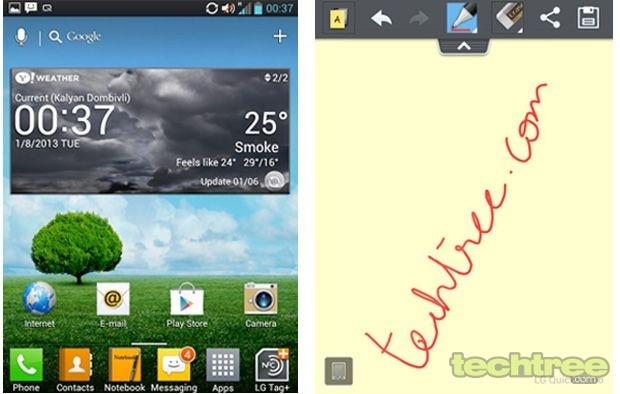 Android 4.0 (ICS), Preloaded with special apps for stylus. 5.5" (l) x 3.6" (w) x (0.3 mm)(d), 168 grams.